I included a two map overlays, two polygons for track layouts, a path for pit road, turn placemarks, and more. You can get the KMZ here. 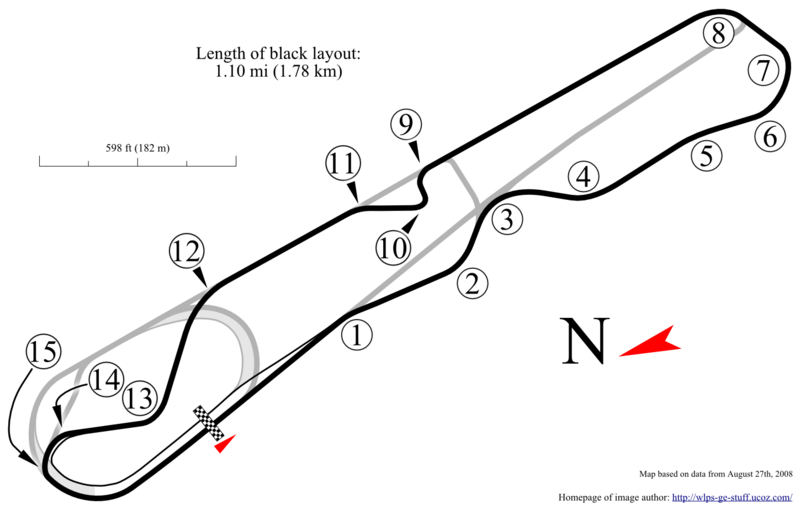 I create a new Wikipedia page for this track at Circuit du Mas du Clos. Feel free to add to it. As for the KMZ set, I included an overlay of my map, polygons for 3 track layouts, a path for pit road, placemarks for turns, and more. You can get the KMZ here: Circuit du Mas du Clos in France. You can get it here: Racing at Circuit de Croix-en-Ternois in France. You can get the SVG here. While many may think of this track as a dragway, it does have a relatively short road course too. I included a map overlay, 3 polygons for track layouts, 2 paths for pit road options, placemarks for each turn, and more. You can get the KMZ here. This street circuit isn't very long, but it is an important stop for many racing series. Grand Am, NASCAR Nationwide, and ALMS have all raced here. I included a map overlay, a polygon for the track layout, a path for pit road, placemarks for each turn, and more. Plus, I happened to stumble on a street based kart track in Trois-Rivières. I included another polygon and turn placemarks for it. You can get the KMZ here. I included a map overlay, a polygon for the track layout, a path for pit road, and placemarks for each turn. I then added info on a nearby kart track. That includes another polygon, another path, and more placemarks. You can get the KMZ here. I created an article for this track at Wikipedia based on the Portuguese page with help from Google in the translation part. Google translated the name too as "International Speedway Rattlesnake". I included a map overlay, 2 polygons for the track layout, a path for pit road, placemarks for each turn, and more. You can get the KMZ here. Don't confuse this track with the others named "Autódromo Internacional Ayrton Senna". This one is near Goiânia, Brazil. I included 3 map overlays, 3 polygons for track layouts, a path for pit road, placemarks for each turn, and more. I then added information for a kart track which includes 6 polygons for the track layouts, 2 paths for pit road, placemarks for each turn, and more. I included 3 map overlays, 4 polygons for track layouts, 4 paths for pit road options, placemarks for each turn, and more. You can get the KMZ here.